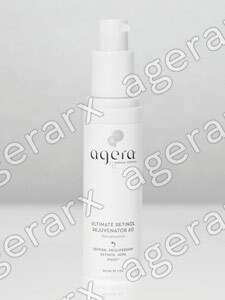 One of the most significant advances in the fight against ageing, a combination of Agera® Rx Bioemulsion Delivery Technology, Retinol and Growth Factor Peptides exclusive to Agera Rx. Specially formulated Retinol with low irritation potential delivered in time-released minute particles (bioemulsion) deep into the skin. Retinol with its scientifically proven epidermal proliferation and skin smoothing effects reduces fine lines and wrinkles. Growth Factor Peptides, the first in a new generation of laboratory proven peptides to simulate skin cell production and collagen and elastin levels. Clinical testing has shown significant increases in epidermal thickness and dermal density. The skin will show a reduction in fine lines and wrinkles with a general more youthful appearance. Bioemulsion Delivery Technology delivery~100nm highly stable, lipid based, rapid penetration, slow release.